LeBron James has kept Akron close to his heart. In 2011, he started a foundation to benefit the youth of the rubber city. As a native Akronite, I give him a lot of credit. Taking pride in your hometown and advocating change is a great challenge in adversity and shows his pride for the area. When LeBron was an itty-bitty kid (weren’t we all tiny once? ), he participated in a yearly bike ride. He felt that the community needed to be more involved than a once-annual bike ride with the kids. Inspired, he created the LeBron James Family Foundation. 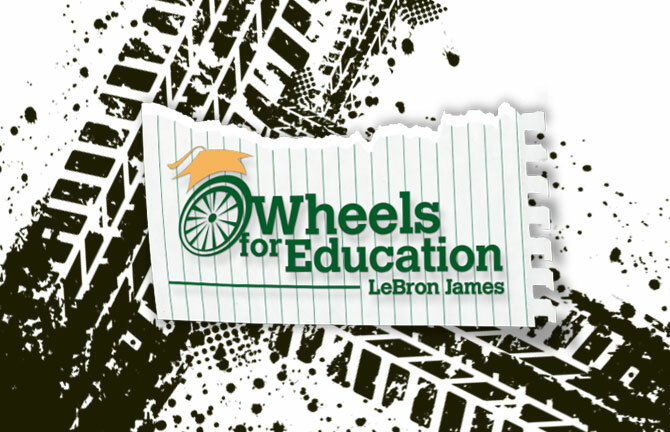 One section of the foundation is the Wheels for Education. Last Thursday, I volunteered with the Young Professionals of Akron for Wheels for Education. Luckily Bean, the organizer of the event, kept us on track, leading us through our tasks at the Bike Kitchen in downtown Akron. We organized bikes, tagged them for the kids and set them up according to school. Personally, I’m really excited for the kids; they’ll learn that there is a reward for promises kept. “They promised him (LeBron) they would go to school, be respectful to their parents, teachers and peers, be active and make good decisions. In return, he promised them that he would be the best role model he could be, on and off the court, ” (Timetopromise.com). I thought that LeBron might have started the program when he decided to come back to Ohio, but surprisingly, it is already year four of the program. And this year, the foundation adopted the fourth group of third-graders into the program. It’s really great that through LeBron local businesses are supporting our youth. I cant wait to see what is next!